Market Research - Resources - Allied Commercial Real Estate, Inc.
Three and one-half years after the Great Recession ended, the economy is still sluggish, and real job growth is not even keeping up with population growth. There is the damage and aftermath of Hurricane Sandy to deal with, the fiscal cliff is right around the corner, and there are fresh warnings from Fitch and Moody’s that they will cut the nation’s credit rating if our $16 trillion debt is not addressed. This is the new normal—and these difficulties and uncertainties will be with us for the foreseeable future. This is the lot we are left with as we run our businesses and invest in the future. It seems that there are more questions than answers as we determine how the new healthcare laws and regulatory and tax burdens will affect our businesses. For commercial real estate investors, finding opportunities in a slow-growth environment may be one of the more daunting challenges we have faced. Economic growth in the U.S. inched up a bit in third quarter 2012, increasing at an annual rate of 2.0 percent from the 1.3-percent revised growth rate in second quarter, according to the Bureau of Economic Analysis (BEA). The increase in GDP during third quarter 2012 was due primarily to a 9.6-percent increase in federal spending, including a 13.0-percent increase in national defense and a 3.0-percent increase in non-defense spending. Consumer spending also increased during third quarter 2012, with real personal consumption expenditures increasing 2.0 percent, according to the BEA. However, business spending pulled back, with non-residential fixed investment declining 1.3 percent in third quarter. In addition, real exports of goods declined 1.6 percent, as the recession in the European Union (EU) takes its toll. This is the first time in more than 3 years that exports have declined, indicating that the slowing global economy is now more directly affecting the U.S. economy. The Federal Reserve lowered its official forecast for economic growth for 2012 to between 1.7 percent and 2.0 percent. However, the Federal Reserve raised its estimate for 2013 growth to between 2.5 percent and 3.0 percent. The Organization for Economic Cooperation and Development (OECD) expects the world’s major economies (except the UK and Brazil) to continue to slow over the near term as well, with the EU continuing to drag down growth, particularly in the U.S. and Japan. Economic growth will remain slow. Real gross domestic product (GDP) increased 2.0 percent during third quarter 2012 as a result of increased federal spending. However, the Federal Reserve lowered its economic growth forecast for 2012, while raising its estimate for 2013 growth. Unemployment will remain uncomfortably high. Despite news that the unemployment rate declined to 7.8 percent in September, there were only an estimated 114,000 new non-farm payroll jobs accompanying this decline. Quantitative easing will be with us for a while. Federal Reserve Chairman Ben Bernanke issued QE3 in September, with the possibility of buying securities indefinitely. The slow global economy is beginning to negatively impact the U.S. economy. The Institute for Supply Management-Chicago Business survey business barometer reading fell to 49.7 in September, the first time that business activity contracted in the past 3 years. Commercial real estate will continue to be a reasonable investment choice for investors seeking realistic returns and minimal volatility, according to CCIM members. This investment class received the highest investment rating of 6.1 on a scale of 1 to 10, with 10 being high, although the rating remained unchanged from the previous quarter. The ratings for stocks and bonds also improved, increasing to 5.4 and 4.3, respectively, while the cash rating decreased to 4.5 during third quarter 2012. CCIM members raised the return versus risk ratings and value versus price ratings for all property types and for commercial real estate overall during third quarter 2012. With the exception of the retail sector vacancy rate, which remained unchanged, the national vacancy rate for each of the property types continued to decline during third quarter 2012. The investment conditions ratings for all property types increased during third quarter 2012, with the apartment sector receiving the highest score at 7.6 on a scale of 1 to 10, with 10 being high. The hotel and industrial sectors’ ratings rose to 5.9 and 5.6, respectively, followed by the rating for the retail sector at 5.4. The office sector investment rating rose to 4.8. On a 12-month trailing basis, transaction volume for all property types decreased, with the exception of the industrial sector, during third quarter 2012. Prices for the various property types were mixed. 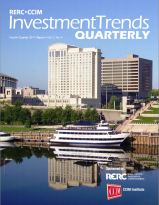 Investment Trends Quarterly's Copyright© 2012 by Real Estate Research Corporation (RERC) and the CCIM Institute.